Flamingos are the pink colored birds with long and slim legs. They are the wading (walk through water) birds, they can stand on one leg for many hours. There are six species of flamingo living in different parts of the world. They are one of the longest-living birds, living for up to 40 years. American flamingos are pink in color with two slim legs and a long neck. They have a white bill on their face with black color on the tip. Flamingos have a pair of wings for flying. They can’t fly standing, but they have to run to catch the required velocity. When the chicks (babies of flamingos) are born they have the gray color. 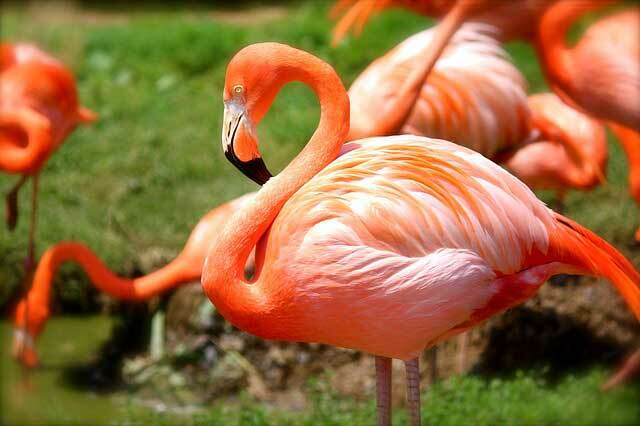 They get their pink color from their diet which contains carotenoid. Flamingos eat the small creatures in the shallow waters, which includes small insects, planktons, and shrimp. They take the mud in their bill and filter out water and mud to get their food. Flamingos mostly stand on their one leg in the water, which also helps them to get the food. Because small creatures in the ponds consider their single standing led as a plant and gather around it. The six species of the flamingos live in different regions of the Earth. They tend to live together in flocks. Their flocks can contain as much as 10,000 flamingos. Flamingos prefer to live closer to shallow water, like ponds and lakes where they can walk easily, so they catch their food. The number of flamingos has decreased in past 100 years due to the destruction of their habitat and over-hunting. 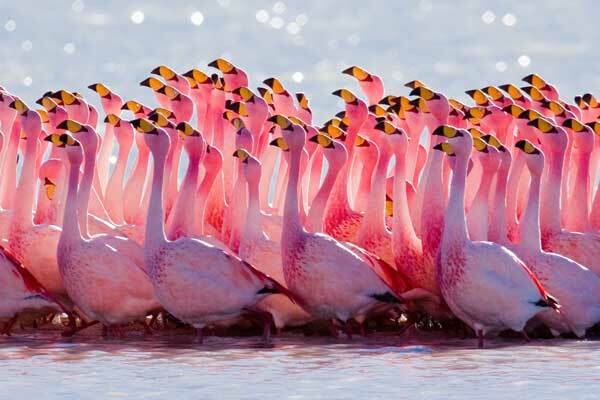 The largest flocks of the flamingos live in the Africa. The number of flamingos in these flocks can reach over a million. Flamingos can fly much better than it is commonly thought by people. They can cover over 100 miles in a day in search of food. Flamingos lay only one egg in a year, and the egg is watched by the parents together. 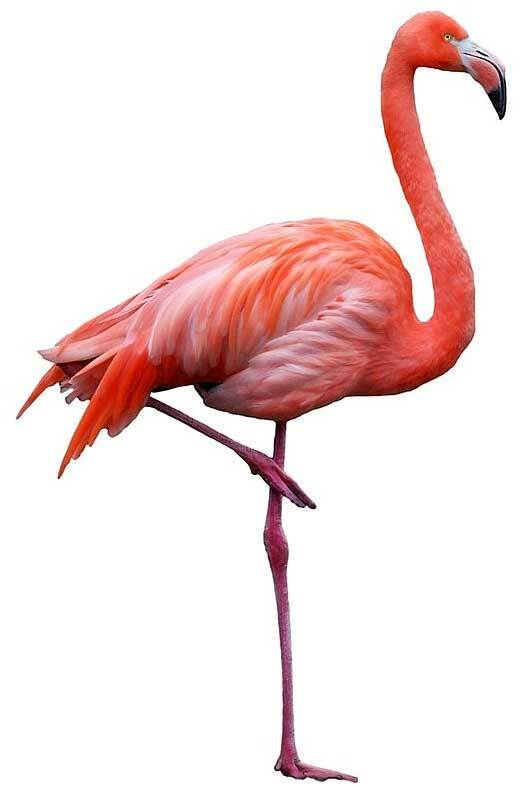 Abdul Wahab, "Flamingo," in Science4Fun, April 13, 2019, http://science4fun.info/flamingo/.